Company Seven works diligently to earn and to maintain the trust of our community. To that end we evaluate each newly arriving telescope with the hope that your first experience with our telescopes will be highly gratifying. At a time when most retailers simply forward a new order to the factory and then have the item "drop shipped" directly to the customer, Company Seven remains more and more unique. At no extra cost to our customer each telescope we offer is carefully examined and tested here at Company Seven to assure our customers receive the best complete example of what the factory is capable of producing. 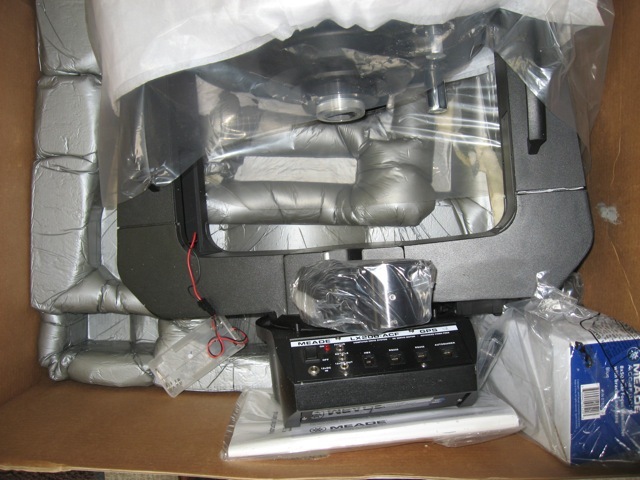 Meade Instruments has provided yet another example of someone at the factory sabotaging their company. On 13 February 2009 Company Seven opened a newly arrived Meade Instruments 12" LX-200 ACF fork mounted Catadioptric telescope. A $5,000 or so this is (when delivered working) one of the most capable and enjoyable telescopes in its price class; it is among the favorite telescopes that we sell in this price and performance class. 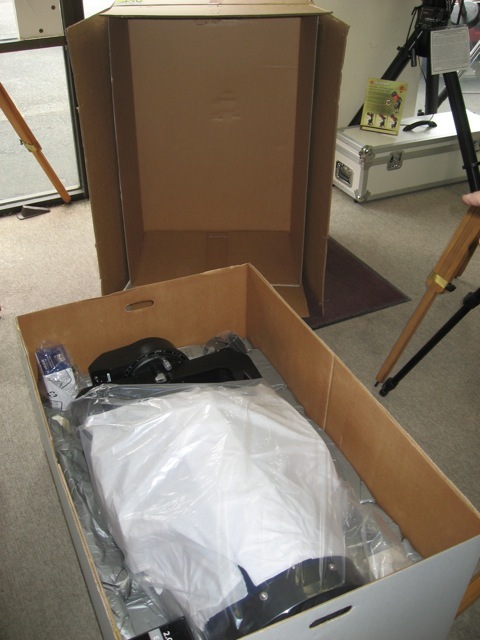 This telescope arrived within its one white cardboard inner packing box packaged within another larger exterior cardboard box. 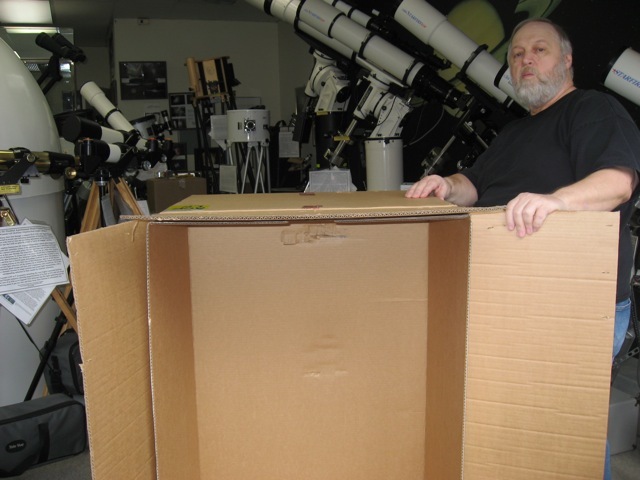 When opened it was obvious the telescope was in disarray, not laying in its recessed area of the foam packing below it. The Battery Pack within the left Fork Arm was dislodged and dangling by wires. The right side Fork Arm had been cracked clear through. Needless to say the telescope failed our quality control process and will be returned to Meade for exchange. The telescope was delivered flat and in its proper orientation on a Pallet by a trucking company, this kept it from being tossed and turned. 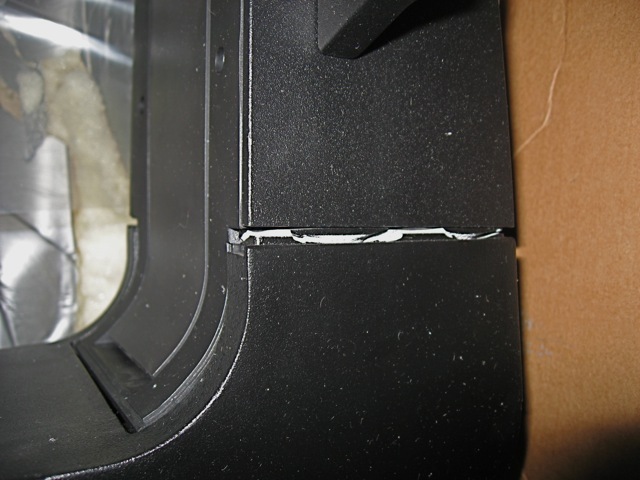 And so we surmise it is most likely the damage occurred before the instrument was handed over to the delivery company. Looking in the packing boxes we found the telescope rests on the lower foam packing, but it is missing the packing foam on the upper half of the inner packing box. Oh and yes, we are out about two man hours even when we reject a telescope this early in the evaluation; maybe we will send Meade an invoice for quality assurance consulting? Incidentally, the Field Tripod that arrived for this telescope was rejected by us too for cosmetic matters; a black casting used to make one of the tripod legs was not painted properly and was in places showing natural aluminum; was ANYBODY LOOKING when this was prepared for shipping? Company Seven insists on comprehensively checking every new arriving telescope. I can not imagine ordering from other retailers who simply have it drop-shipped directly from the factory to the customer and leave it up to the customer to find and deal with problems. Above: 12" LX-200 as found when the inner lid was removed. 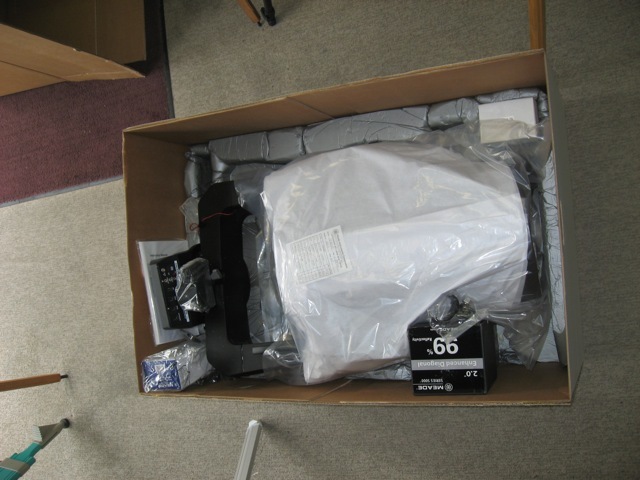 Packing material was not placed atop telescope. Above: Close view showing motorised Focuser riding atop Fork, dislodged Battery Pack, etc. Above: Right Fork Arm cracked clear through. the telescope traveled from the factory to Company Seven upside down, resting with no padding on the floor of the packing boxes. Above: Top half of inner packing box within the outer packing box.